Laurent Duveau - Win a free pass for Silverlight Tour in Vancouver, D-10!! Win a free pass for Silverlight Tour in Vancouver, D-10!! 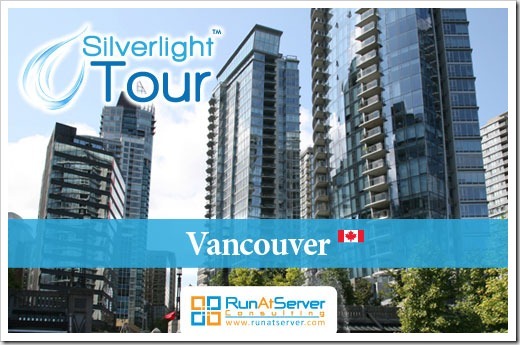 As you may know, the Silverlight Tour Training is coming to Vancouver in may. If you plan to attend, this might be interesting: you can win one free pass to this Vancouver Silverlight 4 workshop in May 3-6, 2010 ($1,995 CAD value) by visiting the SilverlightShow.net community website and participate in the draw! (the pass does not include travel and hotel, only the course). Take the chance to get an intensive course on Silverlight 4 in this four-day training! Learn the ins and outs of design, development and server-side programming with Silverlight in an exciting way, through a mix of lessons, demonstrations and hands-on labs. Enter the draw before April 1st, 2010! The winner will be announced on April 2nd, 2010 in www.silverlightshow.net.